January, the month, is named after the Roman God Janus. 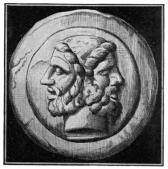 Janus is a two faced God, one face pointing in one direction and the other in the opposite. Janus was the God of Portals (doors and gates and the like) and also the past and the future and curiously fate. The Romans had many Gods and some of them overlapped. Dis was also God of fate in a dark kind of way. So in January we look forward and we look back and some of us make resolutions to do things we probably won't do in the end. I have never been one to be able to make resolutions and follow through with them. I have been able to change my life but that didn't come from a list of resolutions. It came from me realizing I needed to make those changes and doing it. I didn't wait for Janus, Fate or Dis to intervene I just did it. What about those things I couldn't do? They still remain to be done. Maybe I'll get to them in time. I haven't been very consistent writing. I have been busy, doing other things, forgot, avoided writing, etc, etc. Those are the excuses. I haven't felt like writing (truth.) What's been happening? I went to Boston to visit a friend and stayed five days while it snowed. I had Christmas with my father and it was a delightful day. I miss my granddaughter more than you can imagine. And things have been going as usual. Do you get the idea? I feel better now, though. I guess that life will never be exactly what I want it to be. Maybe Janus or Dis is more in control than I thought.